Charter Oak offers exciting opportunities for the whole family! Charter Oak houses a satellite office for both a doctor and dentist, as well as a variety of stores making several services available to our residents. Celebrations held each year are the 4-H and FFA Achievement Days and an annual spring dinner honoring the citizen of the year. 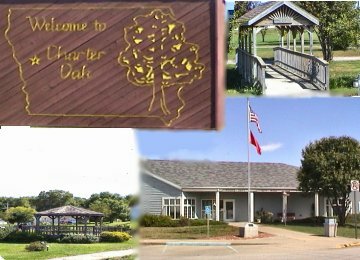 Charter Oak has a city park, tennis courts and swimming pool. Activities for the youth range from 4-H to Little League. The adults can enjoy Commercial and Community Clubs as well as a Historical Club. Community churches: St. Boniface Catholic, St. Johns Lutheran, and the United Methodist. Charter Oak is truly a great place to live and raise a family.